Welcome to the October 2016 edition of our newsletter. I am particularly pleased to be able to welcome Allianz as our first Annual Partner. MOD.A will be delivering a series of workshops for Allianz targeting current and prospective contractors in five Australian capital cities over the next 8 months. This is an exciting new development for MOD.A and we look forward to developing this and other partner relationships as the peak industry body for home modifications. In the same vein I am very happy to announce that we have confirmed the date and venue for our 2017 National Conference, which will be held at ANZ Stadium (the former Olympic Stadium) in Homebush, Sydney on 13 and 14 August 2017. We will shortly begin finalising the program and issuing a call for abstracts and presentations and securing bookings for the trade exhibition. The site is an excellent venue for both the conference and exhibition and offers a lot of extras not available from other venues. We anticipate a great deal of interest in next year's event from both within and outside the sector as the awareness and availability of home modifications increases. October saw the departure of our Senior Occupational Therapist, Sandi Lightfoot-Collins, who resigned after two and a half years in the role. Sandi was principally involved in the development and delivery of specialist OT training and has helped to bring MOD.A closer together with the professional body for OTs, Occupational Therapy Australia. Sandi is now working part-time for the National Disability Insurance Agency (NDIA) in addition to her teaching role at the University of Sydney. We wish her well with her future endeavours. We also look forward to forging a new collaboration with OT Australia to ensure that issues relevant to OT work in home modifications affected by sector reform are accurately represented to both the NDIA and the Department of Health. Finally, I would like to remind readers that our AGM and Industry Forum are taking place on Friday 25 November at the Vibe Hotel in Sydney. More information is available in a separate article but it promises to be both interesting and informative. We very much look forward to seeing you there. The department conducted research among the aged care sector including clients, carers, assessors, service providers and health professionals in January-March this year. The research objectives were to evaluate experiences and perceptions of the aged care system and My Aged Care in its first few months following full implementation. The research identified several key strengths as well as some opportunities to improve and enhance processes. ability to find services after being assessed. Visit the department's website for more information, including the Summary of Findings. Existing and new providers of Australian Government funded home support aged care services are invited to apply for growth funding under the Commonwealth Home Support Programme (CHSP). Up to $115 million is being made available across the country for a variety of identified priority areas, but none of these include home modifications in any of the states or territories. MOD.A aims to communicate with the Department the need for some additional funding for our sector. Please send details of any funding shortages or examples of unmet demand you have seen in the areas you deliver services in to Michael by COB Friday 4 November 2016. MOD.A is keen to hear from its members about any shortfall in funding against demand for services in the areas they work. We are already aware of acute shortages in south-east Queensland, and in some areas of southern NSW, but need to bring it to the Department's attention if funding is not responding to identified need for eligible clients and to remedy this in the current growth round. Similarly, as the growth round features home maintenance in every eligible area, we are keen to understand what they see if the shortfall is with regard to demand. We are aware that there is a pressing need for jobs on houses to maintain them safely, such as gutter-cleaning, fixing locks, alleviating slip hazards as well as specialist trades work for plumbers and electricians, but are unaware of how growth funds can be quarantined for these tasks given the breadth of work that can be done under this sub-programme. We do note the prioritisation of growth funding for allied health services in certain regions of NSW, where it has been historically very difficult to access community based OTs to do home modifications assessment. It is hoped that funds will be allocated in these areas to alleviate the delays that shortages have tended to cause. MOD.A is aware, however, of shortages of OTs in other areas of the country which have not identified funding for OTs as a priority for the growth round. Applications for the CHSP Growth Funding Round opened on Monday 17 October 2016. All applications must be received by 2.00 pm AEDT on Tuesday 29 November 2016. Download the application materials. More information is available on the department's website. There is some promising news regarding future reforms in aged care scheduled for July 2018. The Department of Health held its first consultations with the aged care sector in Sydney on 14 October, and MOD.A was invited to take part in that meeting. Although we are still awaiting the official communiqué to send to our respective sectors we can report that there appears to be a genuine desire to ensure that these changes do not take place until there has been a thorough engagement with all aspects of the sector. An important point for services to note is that the July 2018 date is now being regarded as the starting point for a transition to a single home-based programme rather than the date for its launch. That should allow for time to identify exactly how it will operate and to look at a staged process to merge the two current programmes (CSHP and HCP). There is also an openness to the suggestion that some service types currently delivered will not easily fit under an individualised package model, and the possibility that alternative administrative and funding arrangements may need to be considered. MOD.A is very much of the view that home modifications should be considered alongside the other needs an older person may have when they are applying for a package, but that separate arrangements for funding and for assessing and carrying out the work required need to be in place as well-constructed modifications can have a positive impact on the ongoing support a person may require. It is good that discussion about these important reforms have commenced, and we will keep members informed of any further developments. We anticipate that more formal communication will be forthcoming from the Department shortly, which we will pass onto members. We will also focus on the future reforms at our Industry Forum, which precedes our AGM on Friday 25 November 2016. MOD.A's CEO Michael Bleasdale was invited to speak at two conferences in October about home modifications and housing more generally. The first of these, the inaugural Disability Legal and Regulatory Conference, was held in Melbourne on 27 and 28 October, and Michael spoke about the challenge of providing housing to NDIS participants. His talk looked at the barriers in the design of regular housing and the lack of progress that has been made toward building new housing to accessible housing standards. He also talked about the need for a range of strategies to retrofit the existing housing stock and for the focus to broaden to housing in general rather than being solely upon participants in particular funded programmes. 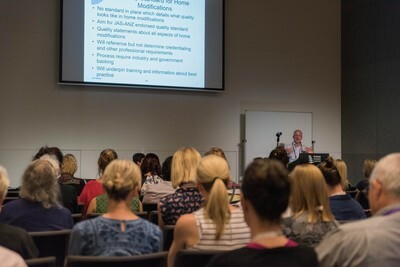 The second conference was the Practitioners for the Future conference of the Northern Territory/Queensland Division of the Occupational Therapy Association, held at the Brisbane Convention Centre from 28-29 October. Michael took part in a round-table panel discussion about home modifications as part of a two-hour session that also featured three research papers on current OT practice in home modifications. The session was an opportunity to talk about MOD.A's vision for a unified industry that develops and promotes best practice in home modifications and the plan for the development of an industry standard. CEO Michael Bleasdale giving presentation at the Practitioners for the Future Conference. We are always looking out for research and new initiatives which promote the benefits of home modifications. MOD.A has recently been in touch with Australian researchers who are looking at the importance of the home to older people and people with disability and how home modifications and other programs can assist people to live successfully in regular housing and what is required to make this happen routinely. Below are some recent and current projects undertaken by researchers in three separate states in Australia. Does not owning your home make a difference to the delivery of home based aged care services? The 2013 Australian aged care reforms aim to deliver increased service flexibility, choice and control for consumers; a greater capacity to age-at-home is one of the anticipated outcomes. However, little attention has been paid to the consequences for older renters. Rental tenants often have constricted rights to modify their accommodation and limited discretionary income, which may lead to reduced opportunities to exercise the choice and control envisaged. There is limited practical knowledge and awareness about how home based aged care services (under the consumer directed care model) will interact with other parts of the Australian welfare system, including our system of housing supports. Research underway at the University of Adelaide is investigating the important relationship between Australia's community health, aged care and housing sectors. The research is seeking to optimise outcomes for older people in the context of choice, independence, housing security, participation in community life and wellbeing; and assist them to age-in-place. The study is exploring experiences and preferences of older low income renters with respect to community aged care and the perspectives of aged care and housing service providers. Can Government-supported home modification schemes for people with disabilities act as drivers of innovation for the housing industry? An important housing related outcome of the National Insurance Disability Scheme (NDIS) is a commitment to funding 'aids and equipment and home modifications' for people who qualify for the scheme. A research team based at the University of Melbourne's Faculty of Architecture, Building and Planning and part of the Transforming Housing program is evaluating three current programs in Sweden, the UK, and Ireland. The research will investigate the relationship between existing housing design, regulation and innovation in anticipating future modifications. The project is asking if effectively reactive modification schemes can be harnessed to proactively influence future private sector housing design and production. The international field work is used to generate a taxonomy of particular design modifications generated by the grant programs that may impact on the way the housing industry designs and builds. Interviews have been conducted in Stockholm, London, Manchester and Dublin with funding agencies (typically National Government agencies), scheme providers (typically Local Government Municipalities), and not-for-profit providers involved in the modification work. The proposed Australian part of the project will investigate whether the various state-based schemes have utilised similar solutions or not, and evaluate the potential for a national NDIS modification program to stimulate innovation in private sector Australian housing design. For any further information, please contact Dr Andrew Martel via email. For information regarding Transforming Housing program visit their website. Dr Tammy Aplin is a Lecturer in Occupational Therapy at the University of Queensland. Her research interests centre on the home environment, with a focus on home modifications. Her PhD involved a qualitative study with clients of major home modification services to understand their experience of home and how the dimension of home impact decision making and are impacted by home modifications. From these qualitative studies, she developed two tools for home modification practice: the Dimensions of Home Measure (DOHM) and the Post Modification Satisfaction Questionnaire. Both tools demonstrated initial evidence of validity and reliability. The DOHM measures five dimensions of home (physical, social, personal, occupational, and temporal) and is completed pre and post modifications. This tool provides an outcome measure for home modifications which measures outcomes relevant to the client (eg: privacy, safety, freedom, connection to home and social activities). In collaboration with Liz Ainsworth, Tammy is currently working on a clinical utility study which trialled the use of the In-Home Occupational Performance Evaluation for major home modification practice. Other current research projects include: evaluating the health and participation outcomes of home modifications; an evaluation of client satisfaction with home modification service delivery; and a qualitative study investigating the experience of older adults receiving home support services. If you are interested in being involved in the research to trial and evaluate the DOHM or want any further information about Tammy's research, please contact her via email. Links to research described in this articles can be found here on Tammy's research profile. MOD.A has partnered with Allianz Global Assistance to present a series of Home Modification workshops in 2016 and 2017. The workshops demonstrate ways to improve quality and efficiencies of home modification assessments and prescriptions. Allianz Global Assistance provides consistent and clinically sound health and lifecare services nationally. They work with a network of over 2,000 Occupational Therapists to complete assessments and have an impressive network of over 1,500 trade providers to complete home safety modifications. They provide over 43,000 assessments per year to Australian War Veterans as part of the Department of Veterans' Affairs Mobility and Functional Services program. Allianz Global Assistance home care products are now available for you to access to service your clients' needs. If you would like further information on Allianz Global Assistance health and lifecare services visit their website or contact lifecare@allianz-assistance.com.au. Allianz Global Assistance and Home Modifications Australia (MOD.A) are proud to present the first in a series of Home Modification workshops in Brisbane on 16 November 2016. The Brisbane workshop will be presented by Liz Ainsworth, a well-respected and passionate Occupational Therapist with over 20 years' experience working in the home modification sector and co-author of An occupational therapist's guide to home modification practice. For more information visit the Events page on our website or click here to register. Places are strictly limited. Further workshops will take place in Sydney, Melbourne, Adelaide and Perth during 2017. Special presentation from Livigy and LifeTec Australia on Smart Assistive Technology. If you are interested in attending the Forum and/or AGM please advise by return email by COB Monday 14 November 2016. We are pleased to advise that we have confirmed the date and venue for our 2017 National Conference, which will be held at ANZ Stadium (the former Olympic Stadium) in Homebush, Sydney on 13 and 14 August 2017. Information regarding a call for abstracts and presentations will be issued shortly. More details regarding the Conference programme and registration will be available in future editions of the newsletter. MOD.A AGM and Industry Forum. Preparing your service for the NDIS and future reforms. Vibe Hotel, Sydney, 25 November 2016. MOD.A Home Modification Workshop. Sheraton Four Seasons, Brisbane, 16 November 2016. MOD.A National Conference. ANZ Stadium, Homebush, 13-14 August 2017.